As you are probably aware, it is not Cats Protection policy to home any cat that is not in tip-top condition. 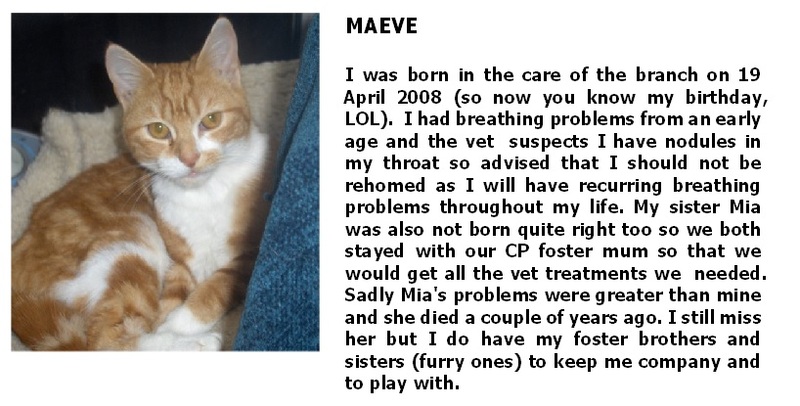 From time to time, cats or kittens come into our branch who are not suitable for re-homing either because of their temperament or because they have ongoing medical problems. These cats stay with our branch and are looked after by branch members, living with them and their own cats. Many have foster "brothers and sisters". We currently have a number of featured long stay cats in our branch. We call them our Sponsor Cats and we have a special fund (The Sponsor Cat Fund) to pay for their Vet Bills. If you are unable to have a cat of your own or would like to help a particular cat with your donation then why not sponsor one of our Sponsor Cats. It costs just £12 (minimum donation) per year and your chosen sponsor cat will send you a quarterly update and picture (by email only if overseas) to keep you up to date with how they are getting along. Sponsoring a cat also makes an ideal present for someone who is, for whatever reason, unable to own a cat of their own. Your donation will help us to ensure that we are able to give these cats the best of everything and as normal a life as possible whilst they are with us. If paying this way, please add a message to say which cat you wish to sponsor. If you would like your sponsor cat newsletter sent by email (which means we can use more of your donation for the cat you have sponsored), please also add your email address in your message, as due to GDPR regulations, Pay Pal no longer pass on your email address.